A native of Dublin, Ireland, Ciarán played the role of The Phantom of the Opera on Broadway and in Toronto for a total of over 1,000 performances. He has also appeared on Broadway in Les Miserables (Babet/Marius) and in the role of Raoul in The Phantom of the Opera for more than two years. Other NY stage performances include numerous appearances with The Irish Repertory Theatre Company; Tom in Grandchild of Kings (written and directed by Hal Prince), Shaughnessy in The Hostage, Ciarán in The Irish...and how they got that way by Frank McCourt, Sir Dinadan in Camelot (with Jeremy Irons), and Woody in Finian's Rainbow. As a producer, Ciarán created the sold out productions of The Molly Maguires directed by Tony nominated director Sheryl Kaller at the FM Kirby Center in Wilkes-Barre, PA in which he also starred. He has three PBS specials to his credit - The Irish...and how they got that way, From Galway to Broadway, and Ciarán and Friends. As a solo artist he has sold out Carnegie Hall four times and The National Concert Hall in Dublin, Ireland. Recordings include "The Irish...and how they got that way", Ha'penny Bridge, and Ciarán and Friends Vol. I & 2. Television appearances include Law and Order, One Life To Live, Another World, Late Night with David Letterman, and numerous appearances on PBS Stations nationally. 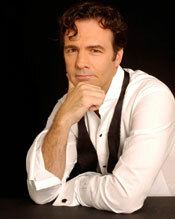 When not appearing with his friends in Three Phantoms In Concert he can be seen touring in concert with Kimilee Bryant (Broadway's Phantom of the Opera), Heather Martin Bixler (world champion Irish fiddle player), and Gabriel Donohue (The Chieftains) or fronting the hard rock/heavy metal band Rattlin' Hum with his fellow Dub Gary Troy.